As discussed in my P&P article, a major safeguard against disability benefit retrenchment in the US is its structural positioning as a “Social Security” program. In the UK, the disability benefit program has always been considered distinct from the old-age “State Pension” program. But in the US, the disability and old age programs have historically been grouped together under the auspices of the Social Security Administration. This connection between disability benefits and the more popular old-age program provides a form of institutionalized protection to the US disability program and is a major reason why that program has historically proven so difficult to cut. It should come as no surprise then that the Trump administration is now attempting to create distance between the disability and old-age programs. In a televised interview last month, Rick Mulvaney, the administration’s powerful budget director, made his position clear: “Let me ask you a question, do you really think that Social Security Disability Insurance is part of what people think of when they think of Social Security? I don’t think so.” He goes on to call the disability program “wasteful” and, in a separate interview, rife with “abuse.” Although President Trump has vowed not to cut Social Security, it is apparent that he does not consider disability benefits as part of that program. Mulvaney appears to be closely following the British playbook. As I show in my article, disability benefits in Britain were successfully retrenched in 2008 when politicians exploited the historically weak structural protections afforded to the disability program while directly challenging the deservingness of disability benefit recipients. Will the Trump administration find similar success in its retrenchment effort? One factor standing in its way is the US Congress, which, far more commonly than the Parliament, has a habit of bringing major social policy legislation to a standstill. Moreover, the majority of disability benefit recipients reside in Republican leaning states. While this geographical feature was also true for Medicaid recipients, and many Congressional Republicans recently voted to cut that low-income health insurance program, the contribution based disability program and its historical association with Social Security remain as major obstacles to its retrenchment. Whether the Trump administration can overcome these hurdles by successfully constructing the need for disability benefit retrenchment, by, for example, attacking the deservingness of recipients, remains a major question. And for the analysts of welfare state retrenchment, the current policy discourse on disability benefit cuts in the US highlights the relevance of historical structures and the essential role of public opinion in policy making. These institutional and ideational factors are likely to be the most important elements when it comes to explaining programmatic cuts to the welfare state. Read Zach Morris’s research article, Constructing the need for retrenchment: disability benefits in the United States and Great Britain, for free until 15 June 2017. 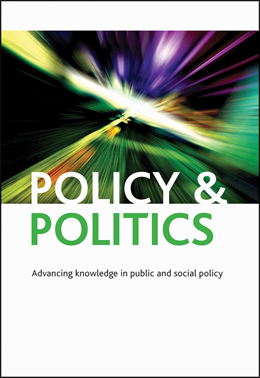 If you liked this article you may also be interested to read Conceptualising the active welfare subject: welfare reform in discourse, policy and lived experience by Sharon Wright.